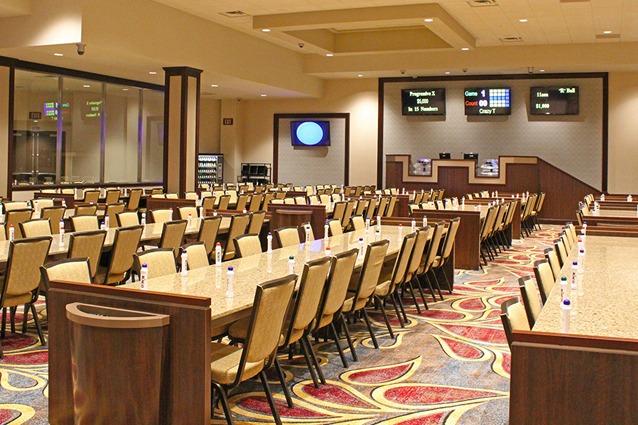 Announcing our New Bingo Room is Open! JW Marriott Las Vegas Resort and Rampart Casino broke ground on the Bingo Room on Dec. 20, 2013, furthering the resort’s goal of meeting players’ demand for an evolving gaming lineup. The 300-capacity attraction, located adjacent to Rampart Casino’s Buffet, now offers players top-of-the-line technology with a FortuNet, Inc. BingoStar® system and non-smoking section. Additionally, unique to our Bingo Room, we’re also offering Double Daubin’. Rampart Casino appointed Joanne Farwell as bingo manager for its new Bingo Room, which opened this spring. Farwell is responsible for all operations of the casino’s latest addition and makes a great fit, having previously assisted with the opening of bingo halls at Arizona Charlie’s Boulder and The Hotel Nevada & Gambling Hall.